Aim: The aim of this study is to evaluate the occurrence of dental injuries among kabaddi players, the level of knowledge of the participants about preventive measures and management of dental trauma. Materials and Methods: A cross-sectional study was carried out, among 100 players aged 16–25 years. 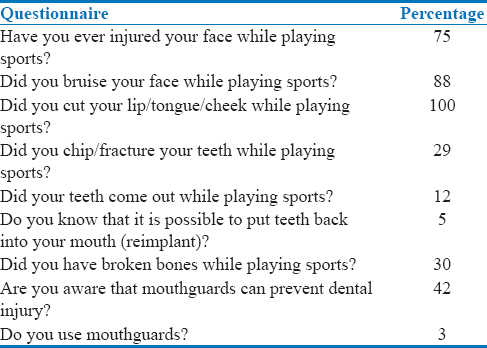 A structured interviewer-guided questionnaire was used to determine the prevalence of oral injuries sustained during sports activities, the use of mouthguard and the athlete's awareness regarding the use of mouthguard. Results: The respondents consisted of males (84%) and females (16%) with a mean age of 18.5 years. Out of the total participants, 29% had chipping or fracture of teeth, 100% had soft-tissue laceration, 12% had avulsion of teeth, and 30% had suffered fracture of jaw/bones. Nearly 5% knew that it was possible to replant the teeth. 83% did not know what is the best time to put the teeth back in the mouth, 91% answered that they would carry avulsed tooth in water, 3% wrapped in cloth, and 6% answered others. Nearly 42% were aware that mouthguards prevent injury. Nearly 3% used mouthguards. Conclusion: Level of awareness and knowledge about sports-related orofacial injury are very poor among kabaddi players in Madurai. Education on the prevention of orofacial trauma should be given to the coaches and players. Wearing of mouthguards during sports activity should be compulsory during practice and competition events. A healthy lifestyle is important for all age groups. Participating in sport-like activities provide physical, social, and mental well-being of all individuals of all age groups. Reasons to participate in sports and physical activity are much as a pleasure, relaxation, competition, socialization, maintenance, and improvement of fitness and health. Literature evidence shows that the brighter side of sports and less attention is provided to the darker aspect, i.e., – sports injuries. Contact sports are defined as those sports in which players physically interact with each other, trying to prevent the opposing team or person from winning. This results in very high incidence of dental trauma ranging from 2% to 33%. This injury may be devastating, affecting appearance, speech, and the ability to eat. Dental injuries are commonly associated with elite sports such as football, ice hockey, soccer, baseball, bicycling, inline skating, gymnastics, basketball, alpine skiing, softball, volleyball, karate, mountain biking, and skateboarding.,, Most often, the dental injury involves the teeth and mainly the central maxillary incisors whereas for the bone injuries, the mandible is mainly involved. There is much literature evidence which highlights the dental injuries among international sports, but least importance is given for regional sports activities. One such sports which had received least attention is kabaddi. Kabaddi is a contact sports played in some of the ancient countries. Kabaddi is a traditional outdoor game played with minor variations in all regions of India – in fact, in most parts of Asia. It requires tremendous physical stamina, individual proficiency, neuromuscular coordination, lung capacity, quick reflexes, intelligence, and presence of mind on the part of both attackers and defenders. Even though this sports requires much potential to play, it's still a popular game because of the excitement and thrill. Kabaddi is also referred as the “Game of the masses,” since spectators totally involve themselves and give the players a great deal of encouragement. Being an ancient Indian sports, kabaddi has received international exposure during the Berlin Olympics in 1936 and later introduced to Indian Olympic Games at Calcutta in 1938. In 1950, the All India Kabaddi Federation came into existence and compiled standard rules. The Amateur Kabaddi Federation of India was founded in 1973. The first men's nationals were held in Chennai, while the women's in Calcutta in 1955. Despite recommendations by numerous groups to use professionally fitted headgears and mouthguards to minimize head, facial, and dental injury, the incidence of traumatic injuries are on the rise among these players. Hence, the role of the dental profession in relation to prevention of dental and other orofacial sporting injuries has become more important. Mouthguards, also called as gum shields or mouth protectors, have long been promoted as a way to reduce the incidence of orofacial injuries and concussions.,, They may prevent fracture or discoloration of teeth by separating the mandibular and maxillary teeth, absorbing and redistributing shock during direct, forceful impacts, and also reducing laceration and bruising of soft tissue by separating the teeth from soft tissue, thus cushioning and distributing the force of impacts. Even though kabbadi has been included in many national and international level sports, only few studies have discussed about kabaddi-related sports injuries and their prevention. Hence, this study was formulated to assess the occurrence of dental injuries among kabaddi players, the level of knowledge of the participants about preventive measures and management of dental trauma, in Madurai. A cross-sectional study was conducted at Tamil Nadu Kabaddi Association, Madurai, after taking prior permission from the authorities. Individuals aged between 16 and 25 years who were present on the day of data collection, participants registered with Madurai Kabaddi Association, those who knew Tamil/English language and gave consent to participate were only included in the study. The study was carried out from July 2018 to August 2018. A structured, prevalidated, interviewer-guided questionnaire was developed for data collection which contained 15 closed-ended questions which is showed in [Table 1]. The investigators interviewed each player separately to avoid blanket answers. The questionnaire contained 15 items: whether any dental and soft-tissues injuries incurred; specifically loosening of teeth, fracture of teeth, broken bones, bruises on the face and lacerations on cheeks, lip or tongue while participating in kabaddi. Participants were asked whether they knew that it was possible to reimplant the avulsed tooth and also the extraoral time within which it is possible to reimplant the teeth. Participants were asked whether they use mouthguard during sports activities and if not state the reasons why they were not using and whether they believe mouthguard could prevent dental injury. The collected data were statistically analyzed. The data were entered in Microsoft Excel 2016, and descriptive statistics were calculated. One hundred players from Tamil Nadu Kabaddi Association, Madurai, participated in the study. Male players (84%) accounted more than female players (16%). Participants' age ranged from 16 to 25 years, and their mean age was found to be 18.5 years. Overall, 75% had sustained orofacial injury during sports. The type of injury sustained varied from bruising the face (88%), chipping or fracture of teeth (29%), cut in lip/tongue/check (88%), avulsion of teeth (12%), and fracture of jaw and bones (30%) in [Table 2]. Only, 5% knew that it was possible to reimplant the teeth. Most of the players (83%) were unaware of the time duration during which teeth could be reimplanted while others responded with variable timing about reimplantation of tooth showed in [Table 3]. Almost 91% of the participants thought water was the best-suited medium for carrying avulsed teeth to dentist, 3% thought it was cotton or cloth, while 6% opted other options showed in [Table 4]. Nearly 30% of participants have broken their bones while playing. None went to the dentist after oral injury. Overall, a total of 42% were aware that mouthguards prevent injury and only 3% had the habit of wearing a mouthgaurd. Most of the participants (37%) did not use mouthguards during sports because they were not aware of it while 32% thought that it was uncomfortable, 28% felt it was not important, and 2% said it was expensive. Various reasons for not using mouthguards were as follows: i am unaware (37%), not comfortable (32%), it is not important for me (28%), it is expensive (2%), and my coach does not ask me to wear (1%) showed in [Table 5]. Sports activities are unfortunately associated with injury risks that include orofacial soft- and hard-tissue trauma and such accidents often have life-long consequences. This study showed that 75% of players had undergone some form of orofacial injury. These findings are similar to the studies done by Tulunoglu and Ozbek and Persic et al., where 22.3% and 20.4% of the participants were reported to have experienced oral injuries, respectively. The prevalence of dental trauma among Pan American games athletes was 49.6%, where 63.6% of them sustained injuries during training or competition. Sports-related dental injuries have accounted for high percentage among all types of traumatic injuries worldwide. Among the participants of this study, who had experienced injuries reported that about 29% had chipping/fracture of teeth while injuries such as loosening of teeth, broken teeth, and facial bone were comparatively lesser. These type of injuries occurred in players when they accidentally fall on their face or they were hit by the equipment used for sports and also due to collision among players. The risk of oral injuries during performing sports can be reduced using mouthguards. Mouthguards offer protection by separating the cheeks and lips from the teeth, making users less susceptible to soft-tissue laceration, and preventing opposing arches from traumatic contact, and these protective devices provide a resilient, protective surface to distribute and dissipate transmitted forces on impact. Various studies have shown that although the participants were well aware of the importance of mouthguards, though very few were actually using them. These findings support that knowledge alone on mouthguard use does not ensure its utilization. Collaborations between sports authorities and dental professionals are recommended to increase awareness and promote the use of mouthguards among athletes and coaches. Players should be informed that the physical impacts of having injuries far exceed the costs of purchasing and the inconvenience of wearing a mouthguard. Most common reason why athletes (37%) did not wear mouthguards was that their coaches did not urge them to wear. It is important to inform players and coaches about the use of mouthguards in both contact and noncontact sports. The present study revealed that cost is not a factor in not wearing a mouthguard, but lack of consideration on the importance of mouthguard in preventing oral injury is the main reason for not wearing a mouthguard. About 32% of participants in the present study confirmed that the fear of discomfort to wear mouthguard was one of the reasons not to wear it. Resistance for wearing of mouthguard might be due to discomfort such as interference with breathing and speech and the effect on the players' image. The knowledge about replantation of avulsed teeth among the individuals was another aspect of our study to assess the level of information on emergency management of dental trauma. In the present study, 5% individuals were aware that it was possible to reimplant the avulsed tooth. One study in literature showed that 65 out of the 112 (58.03%) interviewees were aware of the fact that an avulsed tooth can be replanted. Another study showed that only 34.7% of individuals were aware about reimplantation of teeth. Most of the participants (83%) in the study were unaware about the time duration in which the avulsed teeth could be reimplanted and the best-suited medium for carrying avulsed teeth to the dentist. Other studies have shown that 31.6% individuals had no idea about time duration in which avulsed teeth could be reimplanted, and only 8.3% knew that avulsed teeth should be carried in liquid medium (milk, water, and saliva)., This may be due to the lack of awareness among the players about prevention of dental trauma in sports. This is one of the important results of this study which draws attention to the lack of knowledge and importance of education about preventing dental trauma. There was clear lack of knowledge regarding the medium for carrying avulsed teeth. Most of the participants thought that water was the best-suited medium for carrying avulsed teeth to a dentist and none of them knew about Hank's Balanced Salt Solution. Knowledge imbibed early goes a long way and thereby will help players to lead healthy life away from any disfigurement. Bahr R, Holme I. Risk factors for sports injuries – A methodological approach. Br J Sports Med 2003;37:384-92. Dorney B. Dental screening for rugby players in New South Wales, Australia. FDI World 1998;7:10-3. Roaas A, Nilsson S. Major injuries in norwegian football. Br J Sports Med 1979;13:3-5. Priya M, Sharmin D, Amarlal D, Thomas E, Pooja Y. Knowledge and attitudes of coaches regarding sports related Oro-facial Injuries in Chennai, India. J Dent Oral Disord Ther 2016;4:1-5. Bayliss T, Bedi R. Oral, maxillofacial and general injuries in gymnasts. Injury 1996;27:353-4. Soporowski NJ, Tesini DA, Weiss AI. 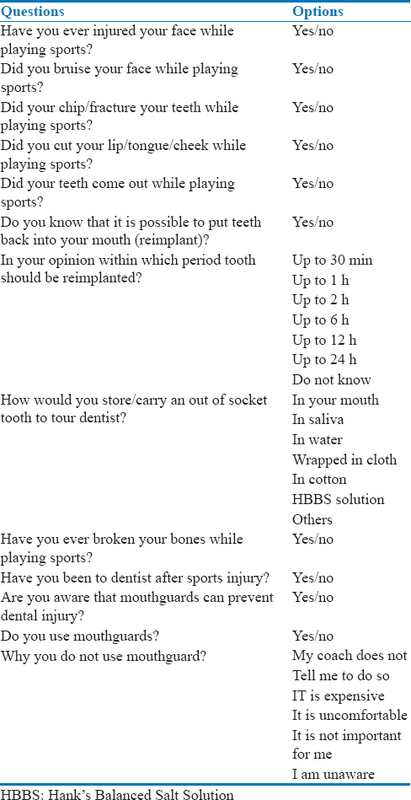 Survey of orofacial sports-related injuries. J Mass Dent Soc 1994;43:16-20. Kumamoto DP, Maeda Y. A literature review of sports-related orofacial trauma. Gen Dent 2004;52:270-80. Dey SK, Khanna GL, Batra M. Morphological and physiological studies on Indian national kabaddi players. Br J Sports Med 1993;27:237-42. Venkatesha Murthy BS. Common injuries in kabaddi play and their prevention with the help of biomechanics. Int J Phys Educ Sports Health 2016;3:78-81. Goswami M, Kumar P, Bhushan U. Evaluation of knowledge, awareness, and occurrence of dental injuries in participant children during sports in New Delhi: A pilot study. Int J Clin Pediatr Dent 2017;10:373-8. Mayer C. Tooth protectors for boxers. Oral Hyg 1930;20:289-90. Watts G, Woolard A, Singer CE. Functional mouth protectors for contact sports. J Am Dent Assoc 1954;49:7-11. Knapik JJ, Marshall SW, Lee RB, Darakjy SS, Jones SB, Mitchener TA, et al. Mouthguards in sport activities: History, physical properties and injury prevention effectiveness. Sports Med 2007;37:117-44. Tulunoglu I, Ozbek M. Oral trauma, mouthguard awareness, and use in two contact sports in Turkey. Dent Traumatol 2006;22:242-6. Persic R, Pohl Y, Filippi A. Dental squash injuries – A survey among players and coaches in Switzerland, Germany and France. Dent Traumatol 2006;22:231-6. Andrade RA, Evans PL, Almeida AL, da Silva Jde J, Guedes AM, Guedes FR, et al. Prevalence of dental trauma in pan American games athletes. Dent Traumatol 2010;26:248-53. Kay EJ, Kakarla P, Macleod DA, McGlashan TP. Oro-facial and dental injuries in club rugby union players. Br J Sports Med 1990;24:271-3. ADA Council on Access, Prevention and Interprofessional Relations, ADA Council on Scientific Affairs. Using mouthguards to reduce the incidence and severity of sports-related oral injuries. J Am Dent Assoc 2006;137:1712-20. Banky J, McCrory PR. Mouthguard use in Australian football. J Sci Med Sport 1999;2:20-9. Lang B, Pohl Y, Filippi A. Knowledge and prevention of dental trauma in team handball in Switzerland and Germany. Dent Traumatol 2002;18:329-34. Donaldson M, Kinirons MJ. Factors affecting the time of onset of resorption in avulsed and replanted incisor teeth in children. Dent Traumatol 2001;17:205-9. Ersin N, Ertugrul F, Oncag O, Menderes M, Uzel I. Evaluation of high risk university students knowledge about dental trauma and emergency procedures. J Int Med Res 2013;6:100-4.